The Oakland A’s expect Kyler Murray to give up on baseball in order to pursue his NFL dreams. The buzz in the football world is palpable, and speculation has built around a possible union between the Cardinals and the Oklahoma quarterback, with the Cards trading 2018 first-rounder Josh Rosen. Such a scenario is “ludicrous” and “not happening,” a Cardinals source tells Ian Rapoport of NFL.com (on Twitter). New Cardinals coach Kliff Kingsbury has referred to Murray as a “freak” in the past and lauded his immense potential. Still, giving up on Rosen so soon in favor of a talented, but undersized, QB prospect, would be incredibly gutsy. You can never say never on anything – particularly when the Cardinals already went way outside of the box to hire Kingsbury – but the odds of this happening do feel unlikely. 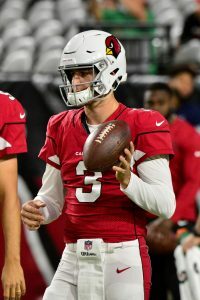 The Cardinals have a number of needs to address on both sides of the ball and trading Rosen for pennies on the dollar to replace him with another rookie QB would not make a whole lot of sense. Instead, the Cardinals would probably be best served by going with another position with the No. 1 overall pick, or trading down in order to take care of multiple areas of need. Rosen, 22 in February, finished out with a 3-10 record in 2018. Give up on baseball? Did you even read the other article writer guy? It’s been explicitly said by multiple sources that there’s no chance of him playing both football and baseball. He’ll enter. If he’s not taken in rounds 1 or 2, he will probably play baseball. but yes, there is zero chance of any NFL team allowing their QB to play another sport. The time needed to learn that position is too great to be successful if you’re concentrating on something else. The money doled out to QBs is too much to allow someone to risk injury playing another sport. If he says he’s focusing on football 100% he’s gone in the top 10 possibly even top 5 if a team trades up. No 5’6” quarterback has ever been taken in the first round. He’ll get picked apart at the combine. He’s 5’9 shortest not 5’6, he’s not a prototypical QB he’s not gonna be sitting in the pocket trying to throw over 6’5/6’6 guys. Talent > height how is he getting picked apart at the combine? Great speed and probably has the second best arm behind Haskins, we have not seen a player that brings his kind of electricity and excitement to the field since Vick we just haven’t. Why do you haters keep saying he will have to throw over 6’5-6’6” guys in the NFL therefore won’t be able to make it??? Oklahoma has one OL that is 6-2. Three that are 6-3”. Two that are 6-4”. Every other lineman in their program is 6-5” and taller. Get a better argument because people that know the game don’t just regurgitate some other idiots argument because it sounded cool. Facts are he threw over OL the same height as NFL guys all year and won the heisman. If he doesn’t do well in the NFL it won’t be his height, it’ll be because he can’t adjust to the style of play bs being in the Big 12 which has minimal outstanding defensive minded teams. That wasn’t directed at Truth12 by the way. Just tired of the others saying his height is an issue. You’re telling me we haven’t had anyone similar since Vick? … That said, all depends on th return for Rosen.. say Giants give up their 1st then it’s worth it.. I mean, he’s already agreed to focus 100% on baseball. he’s showing his word means next to nothing. If I was a GM, I’d stay faaaaaar away from him, cause what are you going to do when he changes his mind again? Getting to the Show is a grind and a half. Get that NFL money, kid. The story leaves out the only reason this is being talked about. There is no rumor out there saying the Cards would do this. There’s no high level exec or draft prognosticator predicting it. This hit the news stream purely for the coincidence of Kingsbury’s comments in October when he said he’d take Murray 1st overall if he could. it was hyperbolic praise of an opponent, innocent enough given he didn’t think he’d be in a position to make good on it. But now, that seemingly out of nowhere, he is in that position people like pointing out the coincidence… even though no one believes it’s a remote possibility. Hey it’s the Cardinals so they are probably thinking of hiring Steve Pisarckiewicz as a QB coach too. Lincoln Riley reached out to evaluators for him to figure out where he would go in the draft if he would enter weeks ago. Everyone is assuming he would go to Arizona because of an old video of Kliff talking him up before he was the Cardinals coach. He wouldn’t enter the draft if it wasn’t worth his while. Cards will trade down as much as possible to give their new coach as much help as possible. Unless your in the market for a franchise QB there really isn’t any reason to be drafting in the top 5. Cards, Bills and Jets got their guy last year so they could be willing to draw back some. Maybe they work something out with the Jags and Dolphins who really need to push for a top QB. That usually means it’s as good as a done deal. Okay… You traded a 1, 3, and 5 to get Rosen. #15, 79, 152. If you could get a similar package back for Rosen, then sure why not? This isn’t the draft where you trade out of #1 and get a enormous haul. At least it doesn’t seem like it. You guys realize his line at Oklahoma was one of the tallest in the league right? Seriously. Didn’t seem to hamper him one bit. 4 of 5 of those guys are about to be drafted too. His height is a non factor. I’m not concerned about height until Murray Steps out of the pocket and gets smacked around by Khalil Mack. That’s when I’m starting to wonder if his body can hold up. Russell Wilson is 5’11”. Same as Murray. And he’s been great. So there is hope.